Did you think City Sightseeing’s 3-for-1 Kids’ Special is such a great deal that you can’t possibly save more? Add our Pensioner Special to the mix and not only do the children hop on the red bus for free, but grandparents only pay half price for their one-day tickets, too. 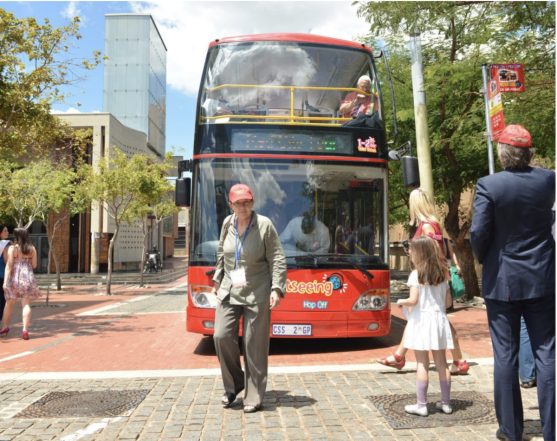 With the Pensioner Special, South African pensioners receive a 50% discount on City Sightseeing’s one-day ticket on weekdays in Johannesburg and on Tuesdays and Fridays in Cape Town. With the 3-for-1 Kids’ Special, two children under the age of 18 can ride on the bus at no cost as long as they have one paying adult accompanying them. The 3-for1 Kids’ Special is only valid on school holidays, public holidays and weekends. -Don’t buy your tickets online. Combining the specials is only possible when buying your tickets at one of our ticket offices or on the bus at any stop along City Sightseeing routes. -In Johannesburg, our ticket office is at The Zone @ Rosebank. -In Cape Town, our ticket offices are located at the V&A Waterfront and 81 Long Street. -Take your South African ID along to qualify for the Pensioner Special and then ask City Sightseeing’s staff members on duty to combine it with the 3-for-1 Kids’ Special. -In Joburg, it’s only possible to combine these specials on a weekday that also falls on a public holiday or in the school holidays. -In Cape Town, you can combine the two specials on a Tuesday or Friday that falls on a public holiday or in the school holidays. For more information on our Joburg specials, click here. Click here or more information about our special offers in Cape Town.